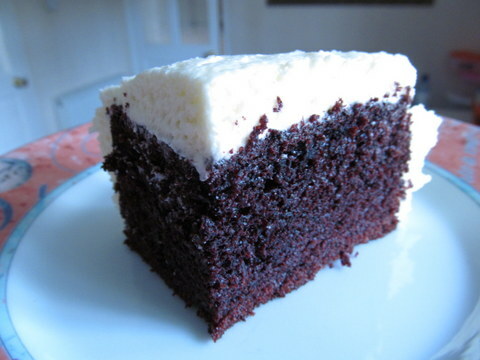 We never get tired of chocolate cakes and this is another one that I've baked over the years. I was in a quandary over this post's title. How to make it distinctive and descriptive? After all, you can only name so much 'chocolate cakes'. The ingredients are very much like what we can find in other chocolate cakes except for this one surprising addition of boiling water. Intriguing! To be honest this is the first time I've used boiling water in a cake batter. I was bracing myself for a flop of a cake but thankfully was very relieved to find out that it results in a very soft, spongy and moist cake. Really really nice. It was not as chocolatey as other ones I've tried before but the texture was something I was pleasantly surprised and very delighted with that I didn't mind if there was less of a chocolate taste. Lastly, this is quite easy since you just combine everything all at once to mix, then add the boiling water last and you're ready to go. 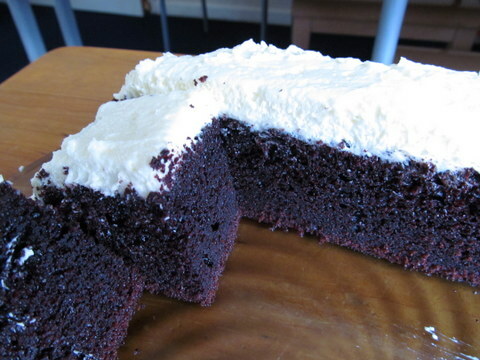 Originally, this was sourced from the BBC Food website but has since discovered that it was virtually the same as Hershey's Perfectly Chocolate Cake except for the salt and sugar! So I will credit them both since I combined them for this version of mine. Grease and flour two 9-inch round (or one 13 x 9-inch) baking pans. Combine all ingredients except the boiling water in a bowl and beat until well combined. Add the boiling water a little at a time while beating until the batter is smooth. Divide the batter into the prepared pans and bake for 30-35 minutes (for 13x9 cake tin - 35-40 mins.) or until a skewer poked in the middle comes out clean. Remove from the oven and cool completely while still in the pan. *To assemble: Remove the cakes carefully from the tin and spread a little of the icing on top of one then put the other cake on top. Spread the rest of the icing on top and all around of the cake stack.